NEW! 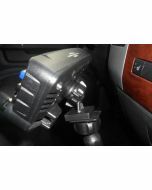 With two directional adjusting knobs and a unique telescoping shaft, this radio mount is ideal for your Mobile Rig, XM, Sirius, or other portable satellite radio receiver. A circular black adhesive disc is also included with the mount and easily converts the super strong windshield suction cup on the pedestal into a reliable console mount.